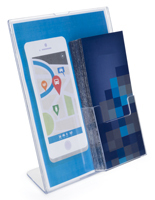 Vertical Holders for 8-1/2" x 11" Signs & Attached Pockets. T-Shaped Designs Allow for Easy Image Refreshing. 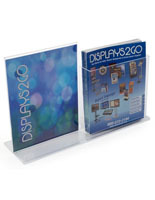 Clear Acrylic Provides Complete View of Inserted Graphics. 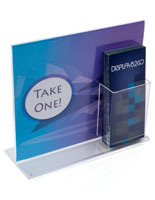 The office desktop flyer holder displays an 8-1/2" x 11" leaflet and holds trifold brochures for distribution to customers. 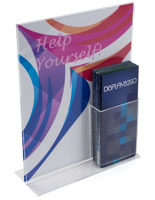 The single pocket at the front of the business frame will obscure some of the larger sign when it is full of pamphlets. 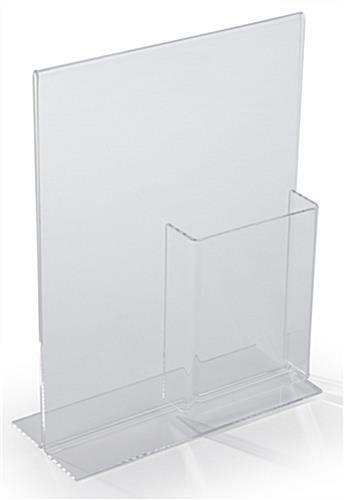 The flyer holder with attached smaller compartment is made of acrylic for durability and affordability. 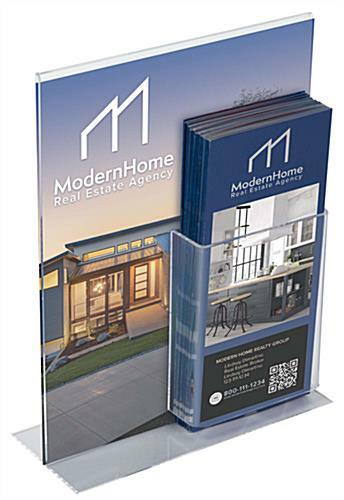 The leaflet display load from the bottom for quick changes to graphics; however, removal of any pamphlets will need to happen first. 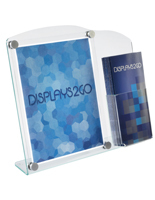 The holder is clear acrylic and so is the single pocket to show entire graphics to those that walk by. 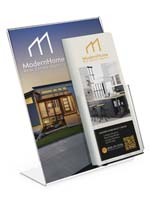 The vertical construction of the business fixture means that it takes up a little less space than its slanted counterpart. 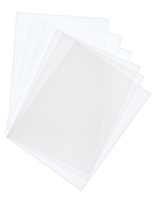 8.3" x 11.0" x 3.5"
4.3" x 5.5" x 1.3"
Product arrived on time and intact. Very pleased with every step of the process. 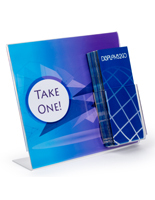 I will be reordering a few more. Thank you.